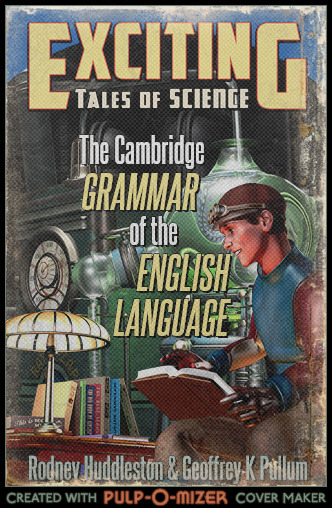 Back in February I linked to the Pulp-O-Mizer cover generator, which lets you design magazine covers in the style of 1950s pulp science fiction. One entertaining way to use it is to design spoof covers for works that are manifestly not pulp science fiction. 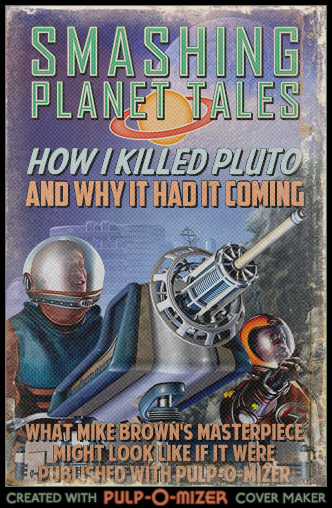 At the time, I’d designed this cover for Mike Brown’s “How I Killed Pluto And Why It Had It Coming“. 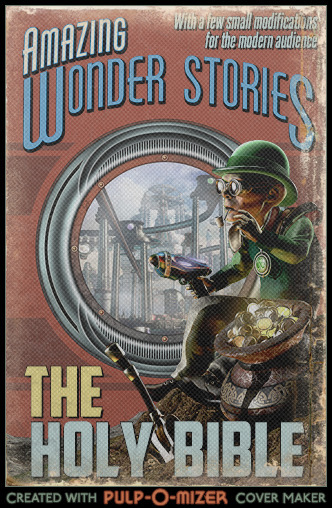 Magazine title: “Amazing Wonder Stories” — the only other remotely appropriate choice is “Enormous Stories“, which doesn’t go as nicely with the background. Background: Futuristic city through round window — the nearest pulp science fiction gets to Heaven, and at least as good as the version in Revelation. Foreground: Little guy jealously guarding his pot of gold — it’s not hard to find a Biblical character who fits this archetype, although not with a gun. I hope that Christians and atheists alike can appreciate the humour in what I’ve done here. I also wondered what cover would be most appropriate for my own autobiography, which I assure you will never be written. I’ve left out the custom text, which would only say Insert Title Here in any case. 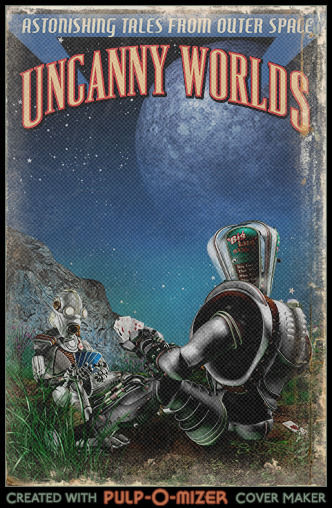 It’s the nearest I can get to a representation of what goes on inside my head (robots playing games under the stars). I’ve done a few others, but these are representative. Feel free to say if you have requests, or if you’ve taken inspiration from any of my designs above. On a whim — and because I’d just cleaned my bedroom for probably the last time in 2012 — I decided to make a video of my bookshelf. Questions for the reader include: “How many do you recognise?“, “Which would you like to borrow?” and “Can you spot a good bookmash?“. Also, feel free to ask questions of your own. As I say in the video description, not every title is legible but it was the best take of several. Thanks to everyone who took part in my punctuation experiment. I got more responses than I thought possible, thanks largely to Stan Carey spreading the word on Twitter. 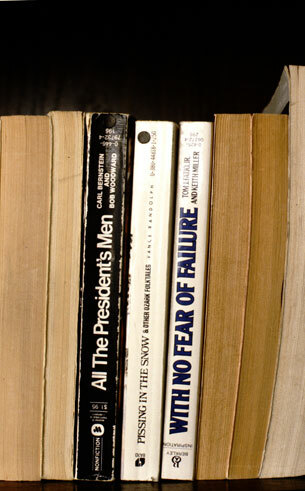 To begin this discussion of the results, here is a photograph of all the books I took quotations from. The full-size image is large enough to read most of the small print. Over on Stan Carey’s blog there’s talk of conducting a punctuation experiment sometime. It’s an idea that I tried out on something he wrote, after which we agreed that we should try it on a more organised scale, with more people involved. Now, there’s only one reason for me not to have a turn at conducting such an experiment — namely that I just don’t have the readership to make it worthwhile. I would be lucky to get one response. When I mention the name Pam Marlow, regular readers of this blog will know who I’m talking about. She was an excellent friend to me and my family until she tragically died from ovarian cancer in 2010. Here is the blog post I wrote after the funeral. A book of her haiku (or “small poems” as she referred to them) has now been published post-humously, under the supervision of her husband Phil. The design was done by the company I work for, though I personally had no part in it. If you would like a copy, leave a comment, or email me, and we’ll talk about getting you one (as a gift, if you’re known to me). If you’d rather make your own arrangements, here’s the online record with the National Library of Australia, where you can find the ISBN and so forth. Click on this thumbnail to see a sampling of pages. There’s a fun little game you might not have heard of yet, but it would not be a bad thing to see it become the next Internet craze. 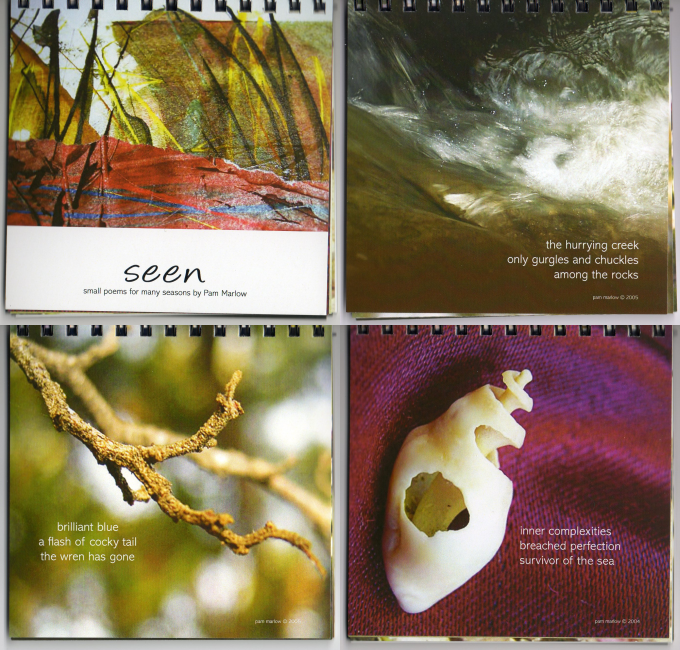 It began way back in 1993 with Nina Katchadourian’s Sorted Books project, which contains a gallery of photographs like this one. And in another reality it might have remained there, except that Stan Carey recently posted about it on his blog (and on Twitter before that, but it took the blog post before I understood it), including photographs of his own creations. 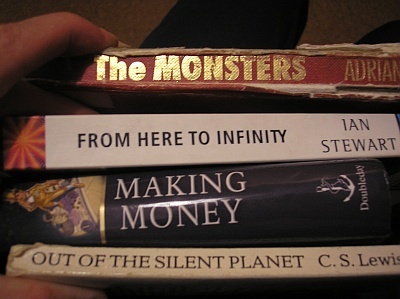 Essentially, the idea is to arrange two or more books so that the titles, when read in the order they appear, make sense (or at least coherent nonsense) as a collective. As a form of amusement it can accommodate a variety of approaches: some might think of it as a form of poetry, others primarily as a form of humour. 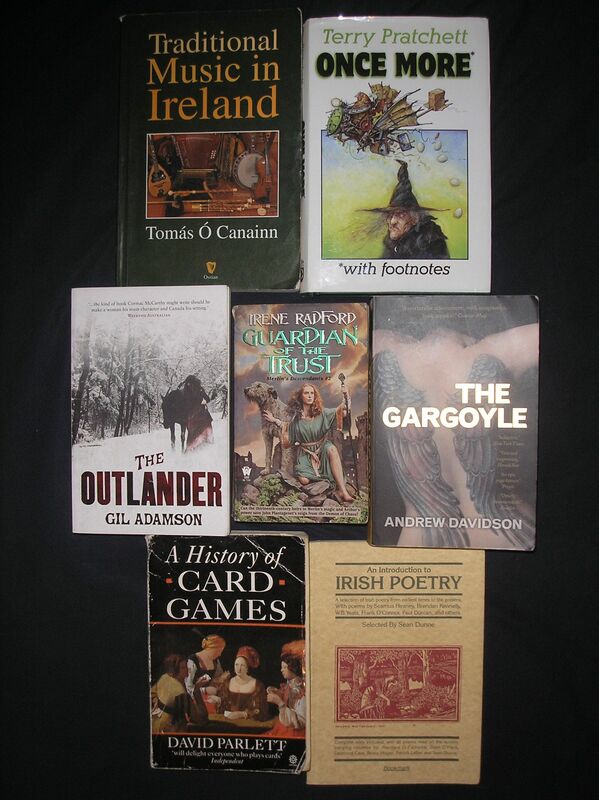 If you have some books, a digital camera, a blog, and the inclination to put them all together, you really should have a go. My own contributions follow. Following on from this and this, I’ve finished the two Simon Singh books I was reading and am now about half way through my advance copy of Chad Orzel’s “How To Teach Physics To Your Dog“. The following comments focus more on negatives than on positives, which is purely in the nature of comments and nothing to do with the nature of the book. Things that are explained perfectly well tend to be invisible, and there’s only so much I can say about them. It’s the things that leave me puzzled that lead me to thinking, and to having something to say. So this isn’t intended as anything remotely approaching a balanced review, quite aside from the fact that I’ve only read half the book. In a shop recently, Mum found second-hand copies of the Childcraft series from World Book Encyclopedia, which were among my favourite books as a child. I’ve often remarked they’d make great gifts for relatives who are about the same age now, so with this in mind, she bought them. The Childcraft series is still being published, but in a form so different from the books I had that they can scarcely be recognised (over the years they’ve gone through many different editions, with some changes to the titles at each revision). Reading the series was a very significant part of my childhood. I received them about one volume a month when I was about seven years old — as an extended birthday present — and their contribution to my quest for knowledge is incalculable.